The Darien Library is the first public library on the east coast to use an Espresso Book Machine which is able to print out paperback copies of out-of-print and some in-print books in a matter of minutes. In an age where people want instant access to nearly everything, the Darien Library is helping to meet that need by introducing a machine that will print entire books within a matter of minutes. 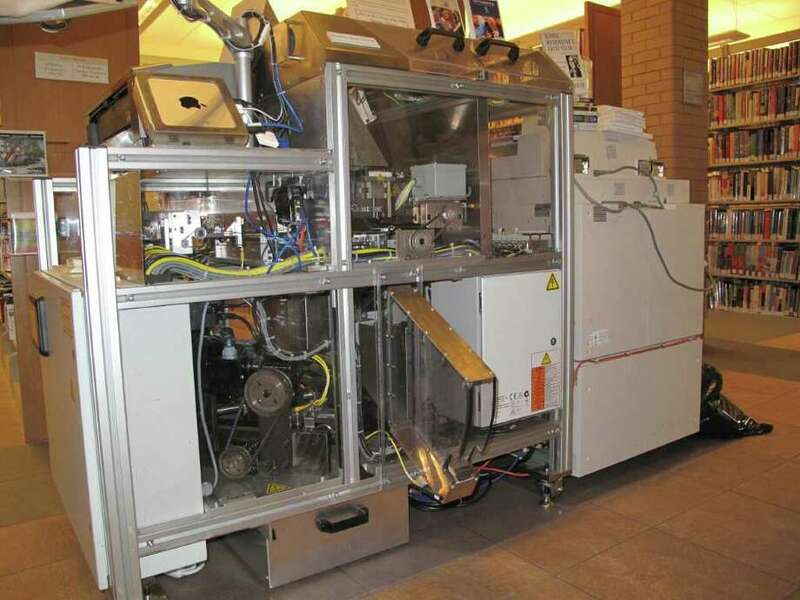 The Espresso Book Machine offers patrons of the library the opportunity to print paperback copies of books that are out of copyright and some books that have been released by publishers such as Harper Collins, McGraw Hill and Simon and Schuster. Alan Kirk Gray, chief administrative officer at the library, said the library had been considering the machine for three or four years before working out a deal with On Demand Books to bring one in. "It is in fact a standalone machine which is married to a high-end copier, in this case a Xerox, which will print an entire paperback book," Gray said. "Right now there are about 5 million books available and publishers are starting to make books that are still in print available." Gray was especially excited that Darien Library now has the distinction of being the only public library on the East Coast with the machine. "We're so happy to bring this to the community because it is absolutely unique and people can get books they aren't aware of," Gray said. "I have books that I want to buy that I loved when I was growing up." The EBM is still a fairly scarce commodity and is typically found in university libraries and in book stores. However, Bronwen Blaney, On Demand custom publishing and retail services manager, said Darien is unique because it is the first machine the company has installed and staffed themselves. "Usually a bookstore will buy the EBM and then train their staff to use it," Blaney said. "I will be here until a full-time technician is hired." Blaney said the process for running the EBM is fairly simply because the machine does the brunt of the work automatically once a book is selected. As long as the machine has sufficient paper, cover stock and glue, books can continued to be printed. "The machine mills the pages and print out the cover and then it wraps the cover around the pages and hold everything together until the glue dries and then cuts the book to size," Gray said. "I love that it's transparent because then people can see how it works." Even though the EBM was designed with idea it would mainly be used for printing books, Blaney said On Demand Books expects to learn about completely different uses for the machine as customers use it. One of the more recent uses for the EBM the company didn't think of was using it to print wedding invitations. "I had a woman who put together a little book and it had the RSVP in the back and it looked really good," Blaney said. "She was able to print her invitations for a lot less using the EBM then if she had them printed somewhere else." Besides printing copies of books that are out-of-print or wedding invitations, the other expected use for the EBM is for self-publishing. "There is a growing market for self-publishing and a big part of this machine is that," Gray said. "Someone who lives in this region can put a book together and come and print out as many copies as they want. We expect to see a fair amount of that happening." Blaney said there are a number of people who use the EBM for self-publishing. The books range from family histories to what could be the next great American novel. "The people I have spoken to who have the EBM say they primarily see it being used to print the more obscure books that are no longer available or for self-publishing," she said. Giving people nearly instant access to books is a benefit to the library but the EBM also helps in not so obvious ways. "This machine helps libraries stay relevant," Blaney said. "You are giving people access to more content." The EBM can also benefit local bookstores because they won't have to gamble as much when it comes time to order books. Blaney said the stores can focus more on stocking books that are popular and if someone wants a copy of a book the store doesn't have in stock, one can be printed out on site. The Darien Library has not yet purchased the EBM but has the option to continue leasing it or buy it. "Right now we're doing sort of a soft launch and won't actively start promoting it until Nov. 15. However, Gray encourages anyone, not just Darien residents, to stop by and see the machine in action. "It is really cool and kids love watching it," Gray said. "People can come by and test it out and it helps get physical copies of books into people's hands."